The Age of Aquarius lives on (sort of) in Volkswagen’s iconic Beetle. 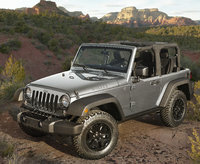 The 2-door, 4-passenger hatchback returns for the 2016 model year in both coupe and convertible form, with either a turbocharged gasoline or turbodiesel powerplant, new perks, and a wide array of trim levels, beginning with the base 1.8T and moving up to the sporty R-Line and the Clean-Diesel TDI. Each 2016 Beetle non-diesel trim level is also offered as an eco-friendlier Partial Zero-Emissions Vehicle (PZEV). The 2016 model year will also see a number of new sub-designations in both the coupe and drop-top, including the 1.8T Coupe S (base), SE, and SEL, with the R-Line and TDI trims also sub-divided into the SE and the SEL. The Beetle convertible offers the 1.8T and R-Line in the S (base), SE, and SEL trim levels, with the TDI version offered in the SE and SEL. Each of these designations reflects upgraded standard and available features. Among the new features intended for the 2016 Beetle are an optional driver-assistance package that provides adaptive cruise control, forward collision warnings, automated parking assistance, and lane-departure alerts, as well as an automatic post-collision braking function. Newly standard for the Beetle SE and SEL trim levels is an upgraded Car-Net infotainment system that includes smartphone apps and a 5-inch touchscreen, while the SEL adds standard navigation and a 6.3-inch touchscreen. All 2016 Beetle trim levels get a new lighting package that includes LED running lights, LED taillights, and bi-xenon headlights, plus a choice of 4 new exterior paint colors. Expect the 2016 Beetle 1.8T editions to keep their 1.8-liter turbocharged inline 4-cylinder (I4) engine, paired with either a standard 6-speed shiftable automatic or 5-speed manual transmission in the coupe (the convertible is only offered with the automatic). Look for the I4 to put out 170 hp and 184 lb-ft of torque, with EPA mileage estimates of 24 mpg city/33 highway/27 combined for the stick-shift-equipped coupe, 25/33/28 for coupes with the automatic, and 24/32/27 for the convertible. The 2016 Beetle R-Line trim level (both coupe and convertible) is again slated to carry a 2.0-liter turbocharged I4 powerplant, managed by either a standard 6-speed manual transmission or an available DSG 6-speed auto-manual shifter, for 210 hp and 207 lb-ft of torque. The coupe edition with either transmission is again estimated at 24/30/26, and the stick-shift-equipped convertible returns at 23/31/26. The R-Line convertible with the automatic transmission comes in at 23/29/25. The Beetle TDI (again, both coupe and convertible) features a 2.0-liter turbodiesel (Clean Diesel) I4 mill that produces 150 hp and 236 lb-ft of torque under the management of either the 6-speed stick shift or the 6-speed DSG auto-manual transmission. Look for mileage figures in the TDI trims to remain 31/41/34 with either transmission. The re-branded 2016 Beetle 1.8T S is slated to return with standard 17-inch alloy wheels and heated outside mirrors, and its interior features include leatherette upholstery, full power accessories, automatic air conditioning, cruise control, telescoping tilt-wheel steering, standard heated front seats, Bluetooth hands-free calling, and a CD/MP3 player with 8 speakers and an auxiliary audio input. The Beetle 1.8T SE and SEL editions add features like satellite radio, cloth or leather upholstery, dual-zone automatic climate control, a power sunroof (for the coupe only), satellite radio, and GPS navigation with a 6.3-inch display. Look for the R-Line SE and SEL iterations to feature 18-inch alloy wheels, a rear spoiler, and a sport-tuned suspension, along with cloth-covered sport front seats, a performance gauge cluster, faux carbon-fiber cabin accents, and alloy pedals. The 2016 Beetle TDI will pack additional standard exterior chrome accents and keyless entry and ignition. Other trim-specific options include upsized and upgraded wheels, leather upholstery, and a 9-speaker Fender premium audio system. The convertible is anticipated to return with a power-opening soft-top roof that can be operated at vehicle speeds of up to 31 mph. Note that while the coupe offers a healthy 15.4 cubic feet of cargo space with all seatbacks upright (29.9 cubic feet with the rear seatbacks folded), the convertible, needing stowage space for the lowered roof, offers only 7.1 cubic feet behind the rear seats. Far different from its flower-power generation ancestors, Volkswagen’s 2016 Beetle is outfitted with standard safety equipment like 4-wheel antilock brakes, traction and stability control, front side-mounted airbags, and front and rear head-protection airbags. VW’s Car-Net emergency alerts and communications is also standard lineup-wide, along with a geo-fencing system similar to Ford’s MyKey, which allows an owner to program speed and audio limits and is intended to help keep teen drivers safe. The 2016 Beetle is scheduled to go on sale in the late summer of 2015, and will once again challenge MINI’s Cooper, Kia’s Forte Koup, and Fiat’s 500 for the sub-compact consumer’s dollar. 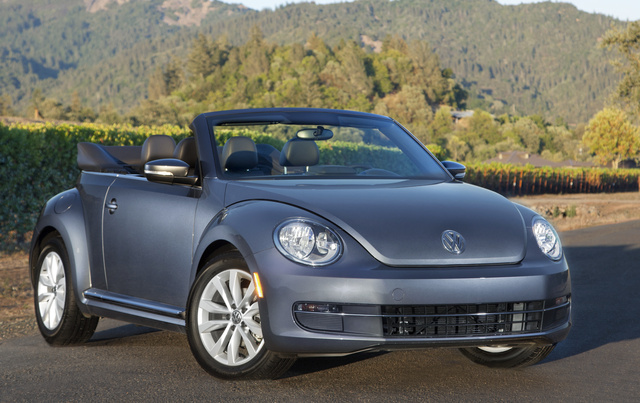 What's your take on the 2016 Volkswagen Beetle? TRIARN I now own my very first Beetle, It's a Red, Turbo 2.0, Convertible, R Line, it's our toy, I traded this for my B.MW. Z-4 sports car, people thought why ? I never owned a Beetle and just to be different this one is a 4 wheeled motorcycle. A truly a great automobile and real fun to drive and yes you will stay behind me. I leased it and 36 months will pass by quickly and then I will be back into my sports car world. Arnie - try one you will be pleasantly surprised, you would want to take this one to Woodstock. TheHorror The Golf and GTI exist, so the Beetle needn't. Have you driven a 2016 Volkswagen Beetle? I have a 2016 VW Beetle, does those radios have a spot to hook a rear backup camera in them? I just purchased a pre-owned 2016 Beetle Denim, I think the radio has been changed out. Can you tell me who the manufacturer was for the factory vehicles? My car alarm has been going off for 24 hours. It won’t stop.